Aloys Hüttermann studied chemistry at the University of Freiburg, graduating in 1997. His diploma dissertation was awarded the Steinhofer Prize in 1998. He gained his doctorate in 2001 with a thesis on synthetic organic chemistry. Dr. Hüttermann passed the German patent bar examination in 2005. He has since been admitted to practice before the European Union Intellectual Property Office. 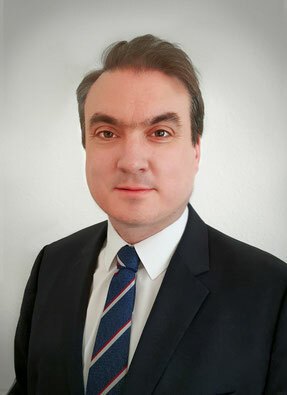 Aloys Hüttermann has also been listed as a professional representative before the European Patent Office since 2006. The Intellectual Property Owners Association (IPO) named Dr. Hüttermann vice-president of the European Practice Committee in 2013, which won the Committee of the Year Award in 2014. Aloys regularly presents at national and international conferences and at universities. He has been a lecturer at Hochschule Niederrhein, University of Applied Sciences since 2014. In the same year, the European Commission (DG Internal Market and Services) invited him to take part in its workshop series on the Economics of IPR Enforcement as an expert. Aloys Hüttermann has authored and co-authored several legal publications in the field of intellectual property. He is also co-author of the textbook "Das Basiswissen der Organischen Chemie" (Basic Knowledge of Organic Chemistry; published by Wiley-VCH). Since 2013 the iam magazine list Dr. Aloys Hüttermann in its "iam 1000". "His technical skills in the biotech and pharmaceutical field are outstanding." Since 2014 Dr. Aloys Hüttermann is listed by Managing Intellectual Property as an IP Star for Germany. Juve lists Dr. Aloys Hüttermann as one of the most recommended attorneys of Michalski Hüttermann & Partner.